Meet the seven-layer dip of my dreams, which is actually… five layers. Let me explain. I’ve encountered quite a few Tex-Mex seven-layer dips at parties and potlucks. They’re fun and festive, and I can’t resist swooping in with tortilla chips. 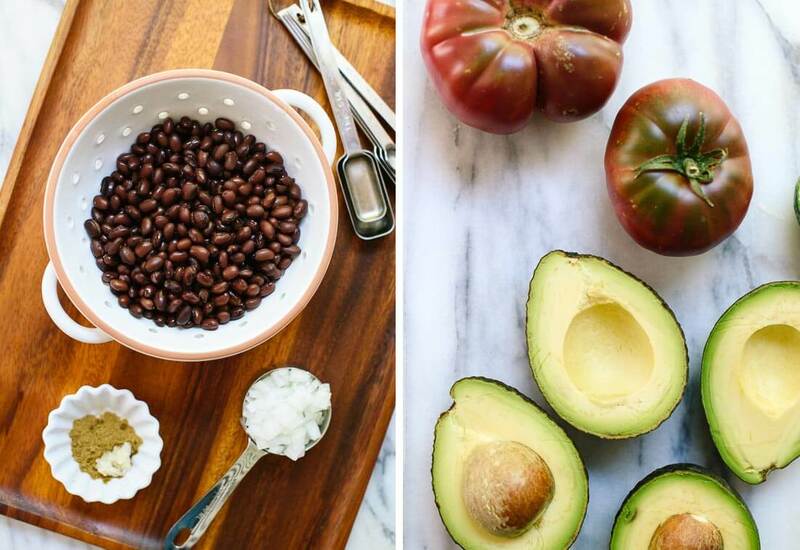 They feature some of my favorite ingredients: beans, guacamole, salsa and tomatoes. You can’t go wrong with any of those. They also include a few of my not-so-favorite ingredients, like pre-shredded cheese that’s all powdery on the outside, and so much sour cream that I feel weighed down afterward. Then there are the canned, sliced black olives on top. My parents always ordered cheese pizzas with those black olives on top for themselves when we were kids. (Was that so we wouldn’t eat their pizza? Well played, Mom and Dad.) I’m forever haunted by the squeak of those olives between my teeth, so I can’t bring myself to use them in recipes. I substituted chopped pickled jalapeños for a similar, briny effect. If you don’t have nightmares about those olives, you could certainly use those instead. 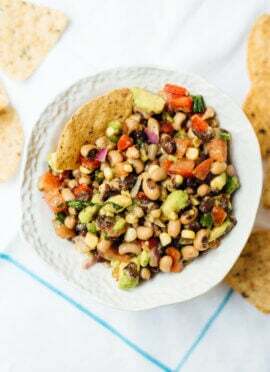 Here’s my dream version of traditional seven-layer dip, which starts with a base of “refried” black beans, which despite the name, only contain two teaspoons of olive oil. Black beans (a pulse variety!) are rich in protein and fiber, a combination that helps regulate blood sugar levels. They’re also high in folate, magnesium and other essential goodness. 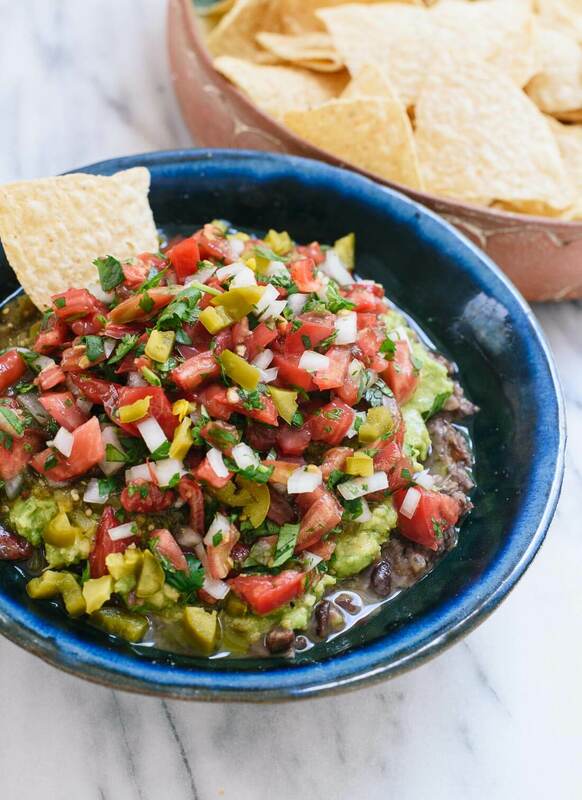 The beans are topped with quick versions of guacamole, salsa verde, pico de gallo and pickled jalapeños, making it a healthy party dip. The only trick is to try to avoid watering down the dip with excess tomato juice from the salsa and pico de gallo, so I have suggested draining them in a fine-mesh strainer in the recipe below. This dip makes a fantastic taco filling, too. Just add some chopped romaine lettuce for crunch. 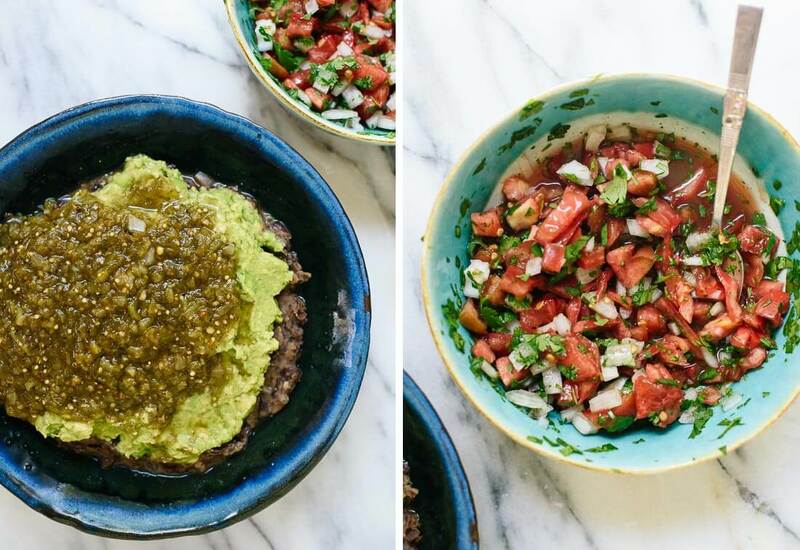 If you want a shortcut version of the recipe below, you can use canned refried beans, and store-bought guacamole (gasp! yes!) and salsa. Just check the ingredients lists to make sure they don’t contain anything they shouldn’t. Trader Joe’s carries all three of those without any weird additives, and I’ll admit that I’ve stopped by on the way to my friends’ places to grab some guacamole. I always call it my Mexican grandmother’s secret recipe. I wish! You could also use this recipe as a template and make it your own. I won’t mind if you layer in some sour cream, cheese and olives if you want to make it more traditional. You all know I’m a fan of beans, lentils and dry peas (which are collectively called pulses), and I’m glad to be singing their praises during the United Nation’s International Year of Pulses. For more information about the benefits of pulses, and to join me in taking the Pulse Pledge—a commitment to eat at least one serving of pulses every week—visit PulsePledge.com. 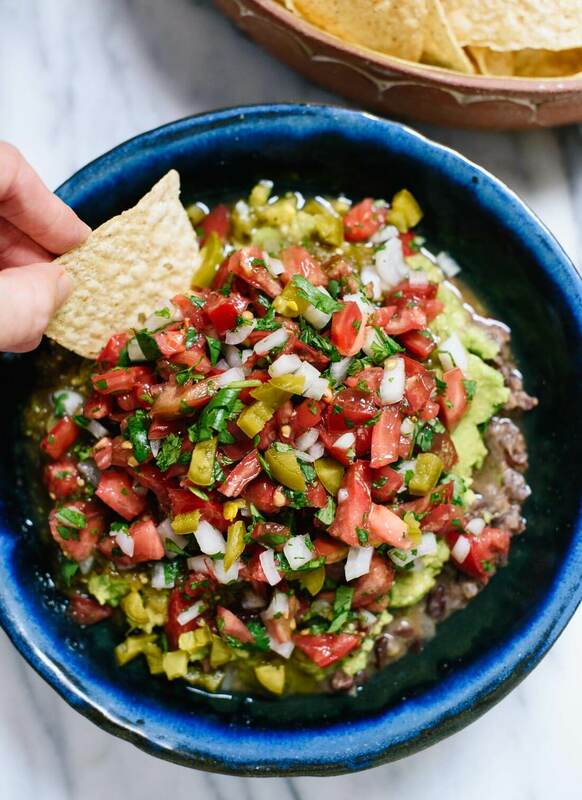 This healthy Tex-Mex layer dip is made with fresh ingredients! Homemade “refried” black beans, guacamole, salsa verde, pico de gallo and more. It’s vegan and dairy-free, too. Recipe yields enough dip for 4 to 8 people, depending on serving sizes. To cook the black beans: In a small saucepan over medium heat, warm the olive oil until shimmering. Add the onions and a few dashes of salt. Cook, stirring occasionally, until the onions have softened and are turning translucent, about 3 to 6 minutes. Add the garlic and cumin. Cook, stirring constantly, until fragrant, about 30 seconds. Pour in the drained beans and water. Stir, cover and cook for 5 minutes. Reduce the heat to low, then remove the lid and use a potato masher or the back of a fork to mash up about at least half of the beans. Continue to cook the beans, uncovered, stirring often, for 3 more minutes. Remove the pot from the heat and stir in the salt and pepper. Taste, and add more salt and/or pepper if necessary. If the beans seem dry, add a very small splash of water and stir to combine. Spread the beans into an even layer in a shallow, medium-sized serving bowl. 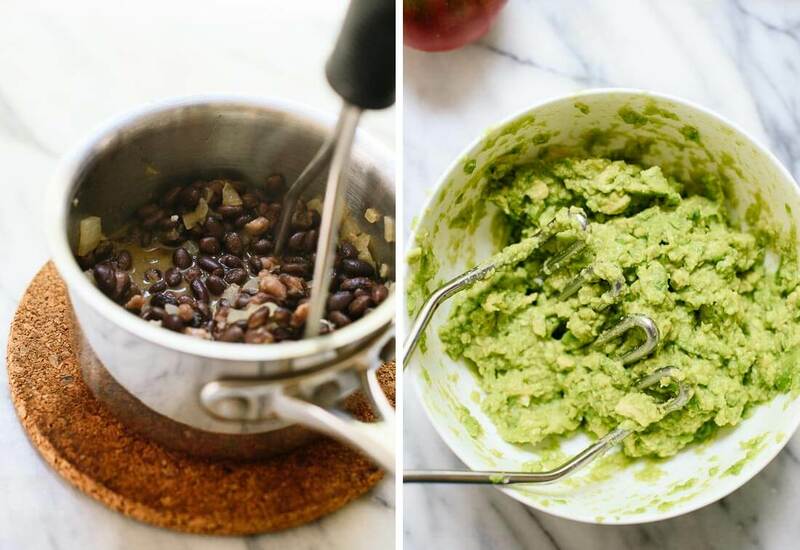 To prepare the guacamole: Use a spoon to scoop the flesh of the avocado into a small mixing bowl. Add the lime juice and salt. Mash with a clean potato masher or fork until the mixture is blended and no longer chunky. Taste and add additional lime juice and/or salt, if necessary. Spread the guacamole on top of the beans, leaving the outer ½” of beans visible for presentation value. 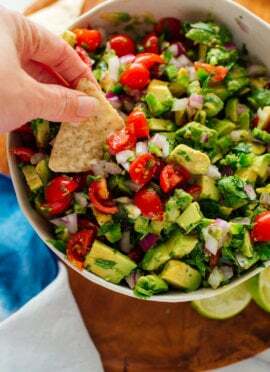 To avoid watering down your dip, drain the salsa in a fine mesh colander, or use a fork to transfers the solids onto the guacamole, again leaving the outer ½” of the guacamole visible. 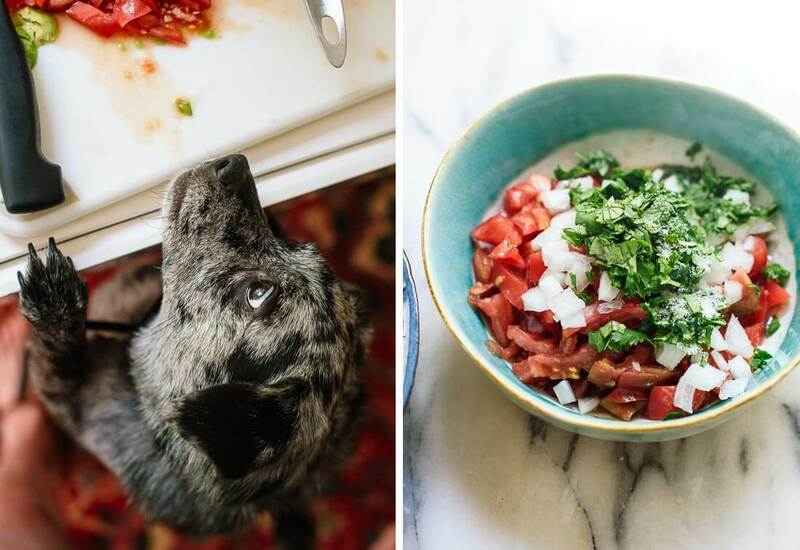 To prepare the pico de gallo: In a medium bowl, combine the tomatoes, onion, cilantro, lime juice and salt. 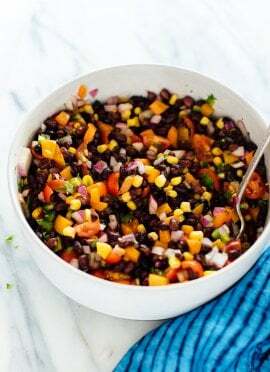 Stir to combine, then use a fork to pile the pico on top of the salsa, leaving behind as much of the juices as possible. Top with a sprinkle of chopped pickled jalapeño, if using. Recipe created with reference to All Recipes. Storage suggestions: This dip is really best consumed soon after preparing, but I enjoyed leftovers the next day. Press plastic wrap against the surface to help prevent the guacamole from browning. 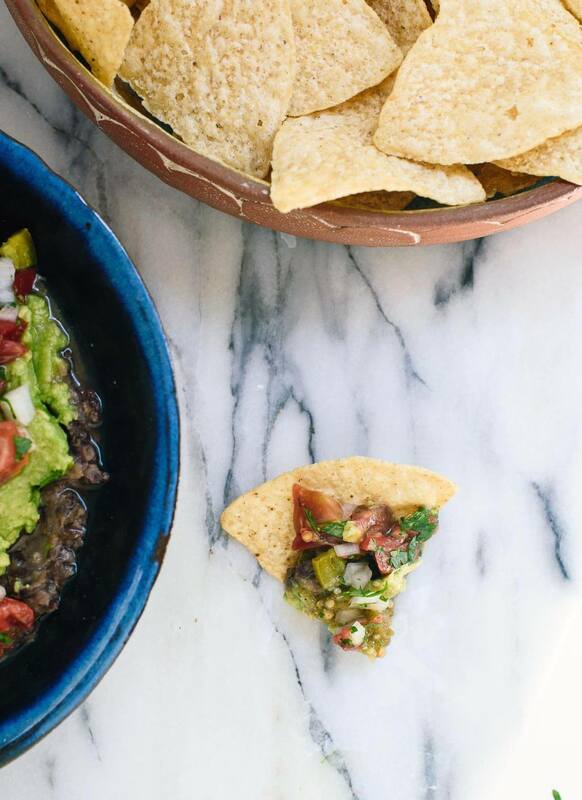 Make it quickly: Substitute about 1 ½ cups each store-bought refried black beans and guacamole. This dip looks fantastic! I am so with you on that pre-shredded cheese too – it’s just a little weird. Your recipe looks so fresh and crisp and basically like it was just harvested from the garden :) Pinned! Yeah, it is a little weird. Can’t get behind that powder caked on the outside. Thanks, Rachel! This looks so delicious and fresh! Fresh dips always have so much more flavor than the store bought ones. Love a twist on an old favorite. I’ve never used salsa verde with this, but it looks so pretty! The perfect recipe to showcase summer’s tomatoes. Thanks, Karen! Salsa verde is my favorite, so I couldn’t resist. I better get a spoon so I can eat this dip all on its own, haha! Oh my gosh! This dip looks amazing! I will def be trying this soon! Thanks Kate. Love all your recipes! Can you tell us an example of salsa verde? Thanks, Debbie! I used Whole Foods’ 365 salsa verde. It’s green salsa made with tomatillos, and I usually find it near the other salsas at grocery stores. I also have a homemade recipe on my site. This looks amazing, seven layers of dip! Wow, I really need to make this. I need to go out and buy tortilla chips! 7 layer dip has always been something I eat, rather than something I love. But I bet that I can love this version. Fantastic. I’m with you in that it always bums me out a bit to find a seven layer dip that could be light/fresh/healthy, but is weighed down by processed cheese or too much sour cream. Variations like yours are great not only as a snack food for entertaining, but along with a small complementary side dish, they’re enough for a light meal. Thanks! I’ll try out this recipe on a summer evening in the near future. I just made this dip and love it! So fresh and light but also full of flavor. I made all layers as you suggested and am glad I did. Thanks for sharing! I made a slight variation on this dip yesterday and it was freaking delicious! thanks kate! Great recipe! Your produce always looks so great… I’m from the KC area and would love to know where you shop!? We had this for dinner last night! Perfect for two (very hungry) people with a little bit left over. I opted for store bought salsa and added a teeny bit of plain Greek yogurt instead of sour cream, it was amazing. Thank you, Mandy! Delighted to hear it. I had this dip as a late lunch myself! A hit every time I make it! So good and so versatile! I’ve subbed pinto for black beans. I’ve skipped salsa verde (because I didn’t have any.) I’ve added sour cream mixed with a little hot sauce. Every variation still turns out delicious! Thank you, Nikki! I haven’t gotten much feedback on this one, so I’m extra happy to hear that you’ve been enjoying it! Hands down best taco dip ever! This dip! So good – I ate it for dinner last night :). I feel much less guilty consuming this than the traditional one I make! I had to make it slightly differently due to some missing ingredients in the house, but still turned out great. Oh and I added a little cheese on top. My hubby said it was the best dip he’d ever had and he loves his dips!! The pico on top really makes this. One of my favorite parts of being an adult is being able to eat chips and dip for dinner. :) I’m so glad you loved it, Devan! Your new book, Love Real Food is my kind of eat! Everything I have tried from your book and blog is tasty. Several people have ask for recipes and I show them your book.